In more sad wrestling news, one of WWF’s famous “cartoon character” wrestlers of the Rock N Wrestling Era has passed away. Today, George “the Animal” Steele died at the age of 79. Although Steele had a long career beginning in the late 60s, he didn’t reach the height of his popularity until Vince JR took over and turned him into a literal animal…a cartoon animal. Steele’s most famous elements were his green tongue, his ME doll and his biting of turnbuckles. None of these said anything about his wrestling ability. 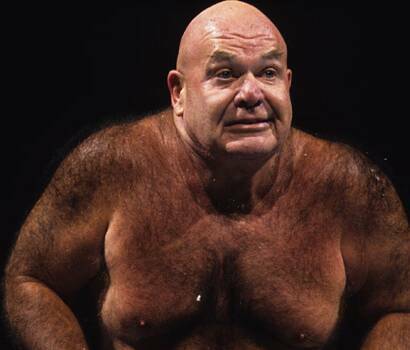 I did a full breakdown of George Steele two years ago, which you can see here. Although it was a fairly blah review of a fairly strange and blah character, I will leave us today with a few of George Steele’s memorable moments. RIP Animal. This entry was posted in Class of 1995, SAD, WWE Hall of Fame and tagged George Steele, rip. Bookmark the permalink. It’s amazing that Steele had a year-long run with Randy Savage from 1986 to 1987, culminating when Steele was in the corner of Steamboat in the famous WrestleMania III match. As for the skills you allude to, I don’t think there were any, ha, ha. Steele was not a good worker, but did have an over-the-top character that I think a lot of people bought, and any of us who grew up on 1980s wrestling cannot forget him.